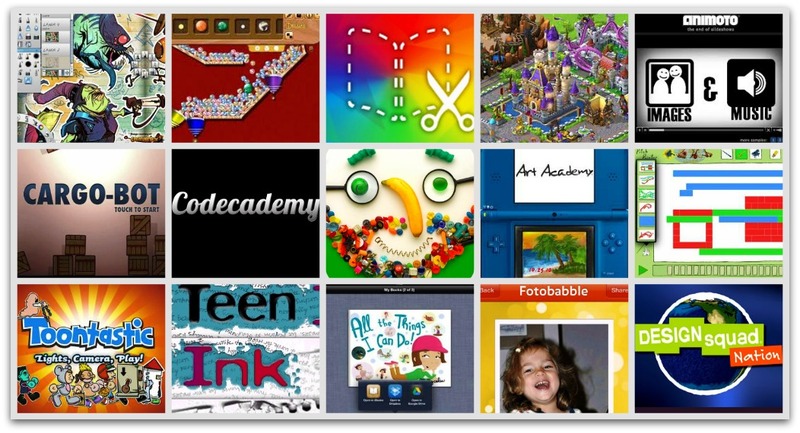 Whether they want to write code for a video game or make an origami crane, children can explore their creative side with these 14 apps, games and websites we love. You've got a creative kid, and summer break gives him or her more time to stretch those creative muscles in fun ways. And creativity is more than arts and music -- making, tinkering and experimenting are all ways kids can be creative. Whether they want to write code for a video game or make an origami crane, children can explore their creative side with these 14 apps, games and websites we love. And check out our Digital Fun for Creative Kids guide for 100+ more ideas to keep kids occupied all summer long. Let the making begin! This stellar app encourages kids to create art from common objects, and video lessons teach about artistic inspiration and symbolism. The overall design is kid-friendly and fun, and kids can share their creations via email and social media and with other app users worldwide. More like a virtual art course than a game, Art Academy offers a ton of in-depth knowledge and expert tips about creating quality artwork. It introduces kids to various sketching and painting techniques -- explained clearly in detailed lessons -- as well as famous artists. Tweens and teens can create digital art using this professional-grade app, developing their unique artist's style as they experiment with the different tools, colors, brushes, and strokes. Offering both free and pro versions, the app caters to a variety of skill levels. Kids' imagination can shine as they create original animated cartoons. After choosing characters and settings, kids develop the story line and script and can even add a musical score if they choose. It's an engaging and stunningly easy way for kids to make their own films. By crafting together a variety of multimedia elements such as images and text, kids use their imagination to create their own e-books, which can then be shared via iBooks, Dropbox, or email. This is an excellent way for kids to practice writing and storytelling skills. Teens who love to write will find solid refuge in this website, which is a community of young writers. Kids will find value in sharing and publishing their writing, and will also appreciate connecting with peers about their writing as well as other topics in a safe forum. In this puzzler designed to teach programming, kids drag and drop directions to get a robotic arm to perform a task. They'll learn the gist of programming concepts like procedural abstraction and subroutines without having to master the lingo or syntax of code. Kids get to experiment with music composition and learn basic elements of music, such as pitch and rhythm, with this stellar app. They can create short musical compositions by choosing different instruments and laying down tracks simply by finger-drawing on a blank canvas. Applying simple technology skills, kids can create custom videos from photos and video clips on this site. Animoto's online tool provides the basic structure but still enables users to add their own unique creative touches. Videos can be shared via email and social media. This fun and relatively simple app lets kids use spoken language to narrate photos. Fotobabble creations take just a few steps to make and can be enhanced with the in-app editing tools, effects, and themes. Teens may need guidance if they share their photos publicly. This virtual construction toy features open-ended play with a hidden physics lesson. Kids set up all sorts of pieces -- ramps, tubes, gears, and more -- and then unleash balls upon their creation. It's great for experimenting or just creating a chaotic mess of motion. This fascinating educational science site from PBS Kids introduces youngsters to the basic principles of engineering. Concepts such as gravity, force, and energy are illustrated through engaging, easy-to-follow games, offline activities, and video demonstrations. Kids design their own theme park and roller coasters in this building sim played on Facebook. As they use their imagination to create coasters with unique tracks and customize a park's layout and appearance, kids learn about following directions and achieving goals. Visit our Digital Fun for Creative Kids guide for more than 100 apps, games, and sites to keep kids creativity occupied all summer long. And tell us -- what's your kid's favorite way to be creative?